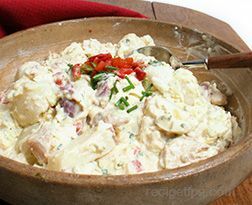 A potato salad not only made with grilled potatoes but also grilled onions and grilled peppers and seasoned with a southwestern flair. 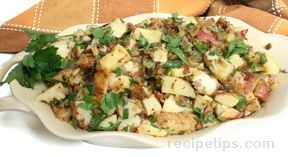 Our Grilled Spareribs and this Grilled Potato Salad make a great combination for any cookout with family and friends. Prepare onions and peppers, put cut portions in bowl, drizzle olive oil over and sprinkle with salt and pepper. Place grill tray on the grill rack, place onions and peppers on the grill rack. Close grill. Cook for about 5 minutes, open grill and turn vegetables over. Should have nice brown grill marks. Continue to cook another 5-10 minutes. Have baking sheet ready on side to place vegetables in as they become done. When vegetables are done, set aside, place prepared potatoes on grill tray. Close grill, cook 10 minutes over medium heat. Open grill and turn potatoes to brown other side. Cook another 10-15 mintues, until nicely browned. 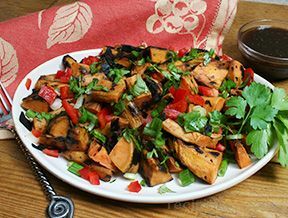 Place vegetables in a large serving bowl, add remaining ingredients and allow to rest at room temperature for 30 minutes or up to 2 hours before serving. 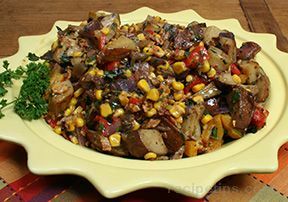 If you don't want to grill the vegetables, place the potatoes in large pot of boiling water, reduce heat and simmer until tender (about 15 minutes). Drain, let cool, then cut into large chunks and set aside in bowl. Add chopped onions and peppers to the potatoes. Add corn, bacon, cilantro, chili powder, oil and vinegar. Stir to combine. Allow to sit for at least 30 minutes and up to 2 hours at room temperature to let flavors combine.